I am a person who enjoys cooking, I find it very relaxing. However, I spent yesterday all day not knowing what I feet like eating, let alone cooking. By 2pm I still had nothing, I was contemplating bacon and eggs. 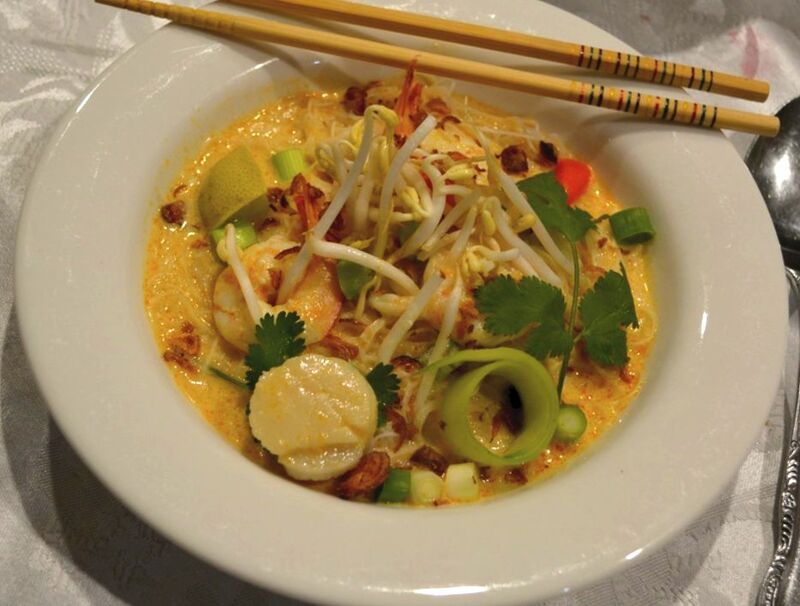 My husband suggested a seafood laksa. So I thought, why not. So off I went to the shop, got all the ingredients, and dinner was made in about 30 minutes. This laksa is like the Chicken Laksa Lemak, I just replaced the chicken with seafood. My family loved it. It was far cheaper than take out, and so much cheaper than going to a restaurant. 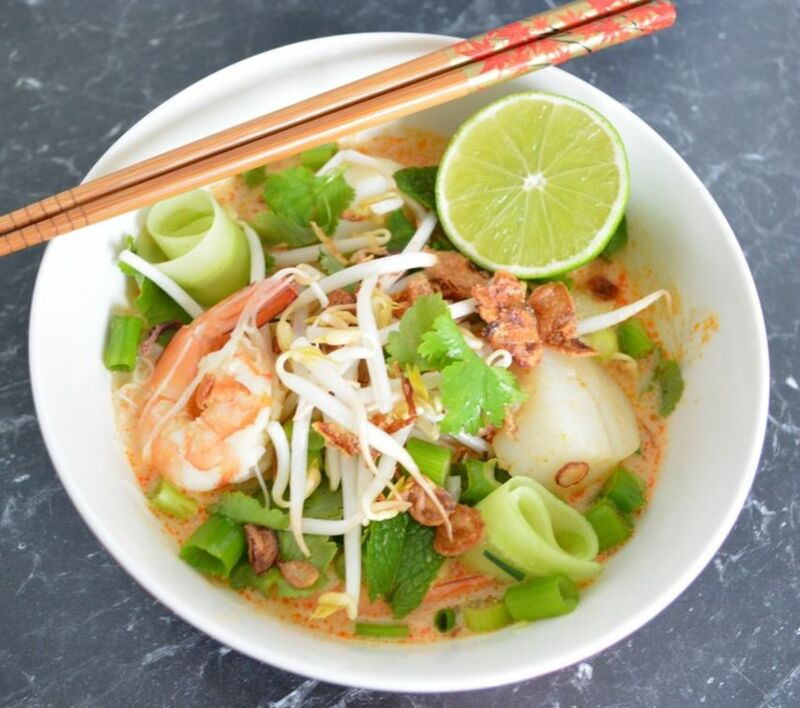 ​I used a Laksa paste (which some say is not real cooking), but on days like these when you just don't know what to cook, and you don't want to spend hours in the kitchen, I say it is perfect. So if you are tired or don't feel like cooking, I say this is a perfect dinner. Although this is a soup, with the noodles and other flavourings, it is a meal that will satisfy the whole family. Heat a wok over medium heat until hot. Add the oil, swirl to coat the wok. Add the laksa paste-it will splatter a bit, cook, stirring for 2 minutes or until fragrant and the oil separates from the paste. ​Add all of the stock, bring to the boil. Add the coconut milk and bean curd, reduce the heat to medium-low. (Now you need to taste the laksa base for spiciness. If you need more spice add 1-2 red chillies. Every laksa paste is different some hotter than others, by adding the chillies you control the heat). Simmer for 10 minutes. Combine the palm sugar, lime juice and fish sauce, pour it into the wok, bring to the boil. Add the prawns and scallops, simmer 1-2 minutes, be careful to not overcook the prawns. Divide the noodles among serving bowls, then ladle over the soup. Top with bean sprouts, cucumber, mint, coriander, green onions and the fried shallots. Serve with lime wedges.